The game is becoming tight and next Sunday will see Nkenna leaving the house. Nkenna's Paloma like attitude will be one contributing factor to her exit now that Africa has got hold of her. 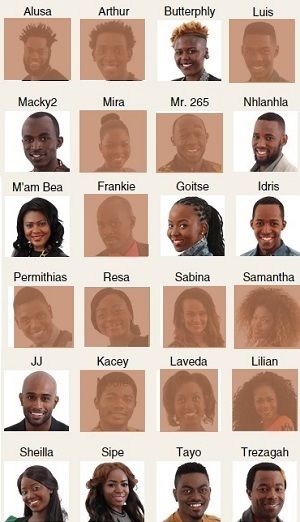 We will not dwell so much on Nkenna now that even if she left two more housemates from Nigeria will still be on board. It is going to be a tight week for Emma who is up with Nkenna and Mzamo in the race to leave the house next Sunday. Jeremy was her "boyfriend" but got evicted on 01.Nov.2009. It is not clear who has assumed Jeremy's position in Emma's heart for the remaining days in the house. 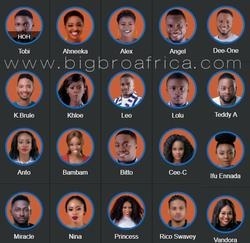 The head of the house who happens to be Edward was called in the diary room to save a housemate which is now by law that you have to save a housemate or else you get on to the firing line, he saved MZAMO and replaced her with Elizabeth who survived being assaulted mutually by Nigeria's Kevin last night. Mzamo is meanwhile feasting on the glass as though it is food. She has been guzzling glasses of wine like her life depends on it to survive throughout the week. The other housemates who have a relaxed week to viewers are: Itai(Zw) Kevin, Geraldine (Ng), Mzamo(Mw), Edward(Nm) and Leonel(Mz).